Useful tools for live broadcasting with On.Live platform. Streaming video rises in its strengths and becomes an indispensable part of many businesses. At this point one third of user activities is spent on watching video. Many companies have major revenue stream generated with user engaging live video feeds. The fact is, that with right mindset, a little determination and correct software/hardware infrastructure, anyone can start broadcasting and achieve success with live streaming. For first timer live streaming over internet can seem a little confusing. However, technology is getting easier to grasp every day, and things which required more complicated setups are now literally few mouse clicks away in streaming software. Launching simple live streams can now be done in minutes, and even more professional studio-quality live video streaming is much easier than in the past. As On.Live platform is up and running we would like to bring closer some of the necessary tools which are needed for live streaming apart of platform itself. We will browse through categories of equipment and try to shine some light on requirements and available tools for live streaming. We will also provide some tips and draw attention to important factors at every point we’ll be talking about. First thing you would need to start your video broadcasting is obviously a camera. Depending on your own choice this could look many different ways. · Laptop and built in Webcam — Easiest option to start with On.Live. Using, standard, but rather better specs laptop is probably the best option to begin with. Advised requirements include at least Intel Core i3 or AMD Ryzen 3 equivalent, 4GB of RAM and Windows/Linux or MacOS X based operating system. Such configuration together with steaming software like free OBS studio should be ideal for decent quality 1080p stream. Of course streaming with weaker hardware is also possible, albeit with lower quality or in 720p. Bear in mind that we are considering pure CPU stream encoding here. Dedicated graphic card with NVENC capability, or newer Intel processor with Quick Sync can greatly improve overall responsiveness of your system offloading encoding tasks to dedicated hardware. At start, On.Live will support Web browser module for streaming, so using a laptop or desktop computer with dedicated webcam is a great way to begin and accustom oneself with the platform. · Streaming from a smartphone. If you are streaming casually, camera in your smartphone may be the only thing you need. Those cameras offer excellent portability and provide decent video quality. You will connect with On.Live streaming platform using RTMP-based encoding app. However, audio quality may be a week spot on smartphone especially outdoors and in windy conditions. Dedicated smartphone mic with wind cover, can be of great help in such cases. To get better quality both for picture and especially sound you may want to upgrade to dedicated video camera. Prosumer models will be a great choice here, however amateur models, or using DSLR will also provide great results. Another option is Pan-Tilt-Zoom camera. Those provide remote control over movement in 2 axis and zoom capability. You may think about PTZ-camera as a more sophisticated webcam with much better optics. There are many options available for those with greater needs. In general, many professionals use video equipment choose pro cameras with SDI outputs. These can range from $ 1000 up to $ 25000 and beyond. If you operate in such price range, probably you have all the needed knowledge or you should seek professional guidance. How to get the video feed from camera to your computer? The answer, is a video capture device. These come in many variants, and their main purpose is to connect via a cable to your camera, and feed video stream to your streaming software. Capture devices come into two main types: capture cards and external devices. Each, generally includes several inputs (most often in HDMI or SDI format). External boxes used for streaming are connected to computer trough full speed USB port. Before you invest your money in such device, first make sure that particular model of your choice is supported by your hardware switcher or live broadcasting software. Note as well if you’re using certain hardware encoders, you won’t need an external capture device. Be prepared to start your streaming business with On.Live, but don’t be overwhelmed with multitude of available equipment. A laptop with 4th gen i5 and a webcam will be enough to start streaming with On.Live. Professional broadcasters use switchers to toggle between multiple video and audio sources, cameras, prerecorded footage, additional graphics etc. to create slick, engaging productions. As the name implies, switcher is generally hardware or software controller that allows to choose different video sources in real time. Most people broadcasting video online will be using software switches. In fact, most people will be using software that integrates switching functions with stream encoding capability, but hardware solutions are much more flexible and provide easier operation and greater control over final product. There are many different brands of switches on the market. From really simple solutions to consoles used at broadcast TV and big production studios. Anyone can find something in his desired price range. We recommend devices from well-known companies like NewTek, BlackMagicDesign, Roland or Panasonic. Don’t be overwhelmed with abundance of options and the prices though. To start basic broadcasting with On.Live you don’t need anything more than a desktop or laptop with webcam and a web browser. Also hardware switches are not a strict requirement here. They just offer interfaces with switches, knobs and mix lever which makes production faster and much more comfortable. Most of these functions can be found in dedicated software, like for instance OBS https://obsproject.com/ or XSPLIT https://www.xsplit.com/. They are free and compatible with On.Live platform giving enormous flexibility in making more engaging streams, with additional overlay graphics, chroma keying, video clips inserting etc. Video quality is important. But there is nothing killing good viewer experience more than poor quality audio. We mentioned smartphones previously. Although sound recording from most smartphones is acceptable, moving for microphone built in semi-pro camera, or dedicated prosumer model is an improvement. Best quality can be achieved with dedicated XLR, mini jack or USB microphones. Make sure your camera supports certain model before you decide for purchase. Of course any combination of camera and microphone will do, but dedicated camera mics simplify the setup and make it more portable. Check offerings from Rode, Sennheiser, Shure, Audiotechnica or Blue microphones if better sounding audio is important to you. There is plenty of options when it comes to microphone type. You can choose “shotgun” mics, with directional characteristic, or “lav”/ lavalier mics that clip onto a collar of your subject. To further improve audio quality, you may look at accessories like booms and windscreens for outdoor use. Tripod, or some kind of motion stabilizer is essential when broadcasting live. People generally don’t like shaky video, and chances are they will leave your stream when they see one. In studio setup opt for heavy, stable tripods with extra features like hydraulic lifts for heavier camera or smooth panning options. If you must move your gear often lighter portable tripod will work in most situations. For outdoor in motion filming use some kind of gimbal. They are very useful, especially when you are filming yourself. · Memory cards or other storage medium for on-camera recording (if applicable). An encoder is the tool that takes your video feed and converts it to RTMP format usually used for live streaming. There are two types of encoders: hardware and software. Hardware encoders are dedicated devices made specifically for streaming purpose. They are used primarily in two situations. The first is intensive studio use with many feeds and possibly even 24/7 transmissions. The other one is field use in remote locations. Due to costs, software encoders are much more popular than hardware ones. Run on powerful enough computer they offer great functionality, and good reliability. There are a range of encoders on the market today. Anyone can choose the product best suiting to their needs and budget. There are even open source products which are entirely free. If you looking for an option to do some testing first, the most popular encoding software, the OBS Studio is a project that includes streaming functionality. It’s also available for Mac, Windows and Linux platforms. More professional payed options include: Wirecast which runs on Mac or Windows, VidBlaster and vMix which are great option, but run only on Windows. Payed software is generally easier to set up and provide more options, functionalities and sophisticated functions absent in free OBS software. Now, when you collected all your equipment and you are ready to start streaming, you will need a streaming platform. The place where your streams will be accessible for everybody on the internet. 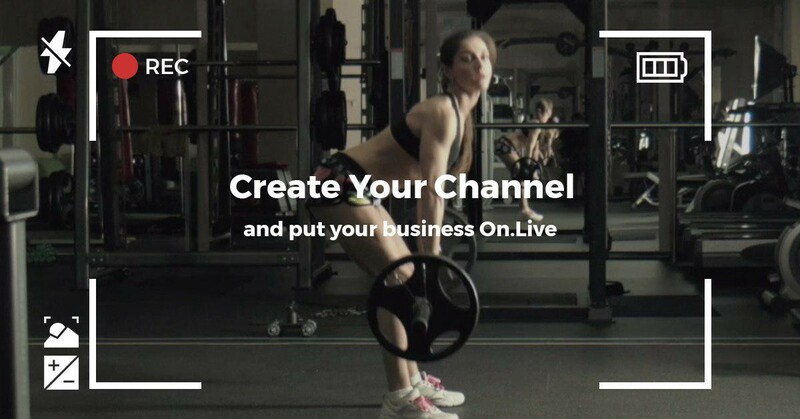 On.Live is robust live streaming platform based on new idea of business model, the open marketplace, where the users are masters of their own streaming business. As a platform On.Live don’t impose anything on users. The most viable model for monetization of content is in the hands of broadcasters. In On.Live there’s no subscription fee. Anyone can start streaming either free, or payed transmissions. We leave prices in the hands of our customers. From the technical standpoint, streaming with On.Live doesn’t differ much from other platforms. It’s easy to set up, and anyone can start streaming out of the box with a simple webcam. Of course there are options for more complicated setups and full support for RTMP protocol. On.Live allows free transmissions or broadcasts in PPV, PPM, or Subscription model. Streaming on demand with prior scheduling and closed group of receivers are also available. Contrary to other platforms and besides payed streams, On.Live allows in stream tips, fund rising, on-platform affiliate programs, payed referral links, and many more. Options uncommon elsewhere are simply built in. On.Live platform is up and running at https://on.live. Try it yourself! We are open for comments and suggestions regarding current and future functionalities. The market place for paid advice live broadcasts and computing power.